The winter months bring many joyful things: the holidays, skiing, warm and snuggly clothing, hot cocoa by the fireplace, and icy windshields on your car. Okay, that last one’s not so fun – but it’s going to happen to just about everyone, with the exception of those lucky devils living in tropical environments. Scraping ice off of your car windows after a long, hard day at the office may be a seasonal tradition, but it’s one that most of us could stand to live without. To help you in that effort, we’re going to show you how a common household product – vinegar – can make winter windshield problems a thing of the past. We’ll start by showing you how to prevent ice from forming on your windows in the first place. Then, we’ll show all of you procrastinators in the audience how to easily remove the ice you failed to prevent by skipping the first step. And all with vinegar. Here’s what you need: 3 cups of vinegar, 1 cup of water, and a spray bottle. Pour the vinegar and water into the spray bottle and shake vigorously to mix. Spray a generous amount of the solution on all of your car’s windows. Vinegar is acidic, and it’s this acidity that will help prevent (or at least minimize) the formation of ice and frost. Do this whenever your car will be outside in the winter weather. As long as you keep that spray bottle filled and in your car all throughout the cold season, you won’t have to deal with icy windows. Any snow buildup should brush off easily. 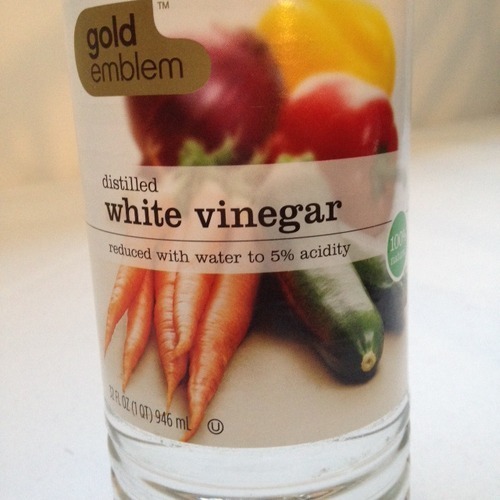 Unless you want to drive around with a messy windshield that smells like balsamic, you’ll just use white vinegar. It’s cheap and sold by the gallon. Okay. Now that you’ve got your vinegar and water solution in hand, start your car and turn the defroster on low. While that heats up, grab your ice scraper and start spraying your windshield with a generous amount of your homemade solution. Scrape the ice as you go to prevent it from refreezing. The acidity of the vinegar will help make the ice melt faster, so scraping shouldn’t take too much effort. Once you’ve completely ridded your windshield of ice and have arrived home safe and sound, be sure to spray your car windows again before you park your car for the night. Some people were concerned that the vinegar might create pock-marks in the windshield, but we found that myth debunked here. It could, however, cause damage to vehicle paint if used in large amounts over time, so just be sure you aren’t spraying your entire car down with vinegar – keep it to the glass. There are actually plenty of ways that you can prevent ice and frost buildup on your car, but this is one of the most effective DIY methods available. And the best part? It’s cheap and won’t require you to buy into any potentially nasty chemicals that’ll do who-knows-what to the environment. Talk about a win-win situation. If you’re looking for more serious ways to prepare your car for the winter, give Openbay a try. They’ll get your car in tip-top shape to be sure you aren’t left with a dead battery or a set of bald tires when you need the traction most. This entry was posted in Seasonal and tagged car maintenance, car tips, cars, chemicals, debunked, freezing, frost, hints, hints from heloise, household, ice, icy, myth, openbay, procrastination, season, snow, snowy morning, tips, tips and tricks, trick, trucks, vinegar, warm up car, weather, windows, windshield, winter. Bookmark the permalink.